Liberals claimed an early lead on Sunday in vote counting across the country after Libya held its first free elections following Muammar Gaddafi's ouster, winning plaudits from the international community. "Early reports show that the coalition is leading the polls in the majority of constituencies," the secretary general of the National Forces Alliance, Faisal Krekshi, told AFP. The alliance that groups more than 40 small parties is headed by Mahmud Jibril, who played a prominent role as rebel prime minister during last year's popular revolt that toppled Gaddafi and ended his four-decade rule. The leader of one of Libya's main Islamist parties, also basing his assessment on their vote count observers, acknowledged the rival coalition had the edge in the country's two largest cities. "The National Forces Alliance achieved good results in some large cities except Misrata. They have a net lead in Tripoli and in Benghazi," said Mohammed Sawan, who heads the Justice and Construction party. 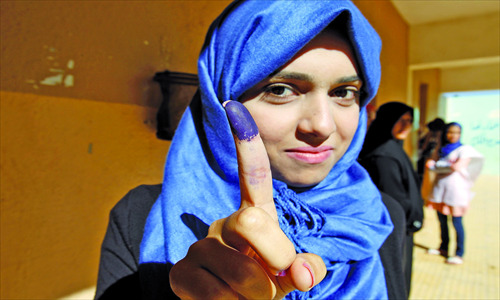 Libyans on Saturday voted for a General National Congress, a 200-member legislative assembly, which will steer the country through a transition period. Turnout was above 60 percent, the electoral commission said. A total of 80 seats in the incoming congress are reserved for political entities while the remaining 120 are held for individual candidates, some of who are openly allied to specific parties. Votes were still being tallied with preliminary results expected by Monday night or early Tuesday. But early media reports seemed to back the party leaders' claims. Private channel Al-Assima TV said the coalition was far ahead in the capital, scooping 80 percent in the district of Tripoli Center, and 90 percent in the impoverished district of Abu Slim. Its lead, the channel said, was also strong in the troubled east, with preliminary figures giving it 70 percent in Benghazi and 80 percent in Al-Bayda, hometown of Libya's interim leader Mustafa Abdel Jalil. These figures, however, were unofficial. "The first winner is the Libyan people," declared a beaming Nuri Abbar, head of the electoral commission, at the end of a rollercoaster voting day, which was briefly clouded by unrest in the east. US President Barack Obama said the vote was "another milestone" in Libya's transition to democracy.